Backgrounds can make all the difference to how an aquarium looks: they can be used to hide cables and equipment, create a more natural looking environment or simply bring out the colour of the fish. The cheapest and most basic backgrounds are usually made from a sheet of plastic and are cut to size when one purchases them. These are usually attached to the outside of the aquarium. They are usually black on one side and blue on the reverse, or have some sort of print (often a planted aquarium, a marine aquarium or rocks). For aesthetic reasons, it is probably best to avoid the ones with the prints. The alternative to these are textured backgrounds, which go inside the aquarium, but these are often very expensive. Another option is to make a textured background for oneself, these often look best, especially for aquariums which are not heavily planted. Textured backgrounds are places inside the aquarium and usually imitate stones or tree roots. My usual preference for backgrounds is plain black, so that is what I am using. Below are photos without background and with the blue background (which is looks lighter when not attached to the aquarium). As can be seen from the photos, the light has a pink glow to it. This is quite unusual for me, as I usually use cool daylight bulbs (colour “865”). 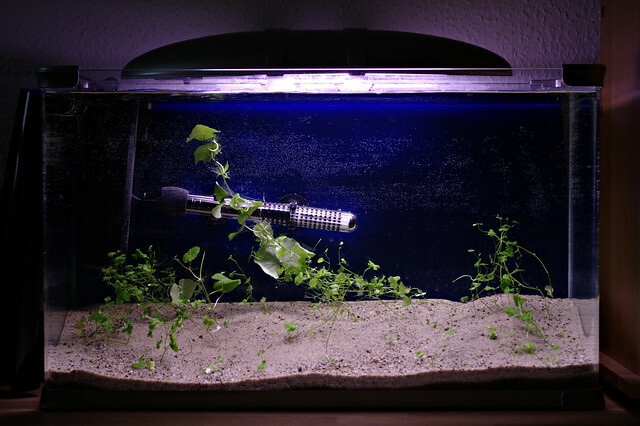 Most manufacturers which offer “aquarium” light bulbs, usually label pink ones as “plant”, although in reality, I think the colour of the bulb makes little difference, as long as the bulb is not green. These results are in a region which I can read, so I am now going to try waiting patiently until nitrite drops to a clearly blue 0 ppm before re-dosing with 1 ml of ammonia (I don’t want to risk dosing so high that I can not read the nitrites any more). So, I was a little impatient and started looking for plant and fish stock… and of course, I grabbed the plants when I saw them (also made arrangements for more species in a few weeks) which means I should spill my ideas about now. I will be using mainly scientific names because many fish have various common names associated with them and some are common between different species. These are fish which either spend much of their time at the surface because they are surface feeders or breath through labyrinth organs. Most common of these are gouramis, Bettas, hatchetfish and some killifish. These fish often have superior mouths. Mid-water schooling fish are most common, they are usually found in groups of a few hundred to many thousands, in the wild, which is why they do best if kept in groups of 6 or more, but even better in groups of 10 – 20 or more. Some examples of schooling fish are barbs, danios, rasboras and tetras. Other mid-water fish also include many livebearers and cichlids. These fish usually have anterior mouths. These fish are often grouped together, but make up two quite distinct groups: fish which live towards the bottom of the aquarium and those which live on surfaces and the bottom itself. The first group include earth eating cichlids, some loaches and some Corydoras, while the latter consists mainly of plecos, shrimp, the remaining loaches and Corydoras. The large majority of these have inferior mouths, although some do have anterior ones. Because the aquarium is only 60 by 30 cm, it restricts me to only the smallest species, as I want my fish to have enough space to turn around and interact with their environment. 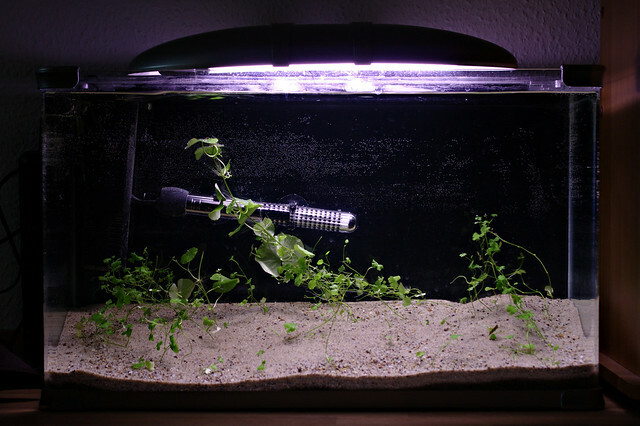 So, I am restricted to about 30 mm for active schooling fish and 50-75 mm for fish which have low levels of activity. I am going to go for the standard configuration: one group of schooling fish, one group of “bottom feeders” and a couple of centrepiece fish. First, I need to decide on which fish I wish to focus. As I have not kept loaches in the last five years, they are one of the species I want to look at. Also, living in Germany, has given me access to many unusual species, such as Boraras, so this is starting to look like an Asian themed aquarium. Asian leads me to thinking about gouramis and Bettas, my LFS currently had some Betta channoides, B. strohi, Parosphromenus deissneri, Pseudosphromenus cupanus and P. dayi. So I do a search of all these species, first on Fishbase then read the first ten search results for each, as the internet is not exactly renowned for the accuracy of all information. Average results show me that all species are suitable. I already happen to have a pair of Pseudosphromenus dayi, so they’re going to fill my “centre piece” and “surface feeders” slots. Now, that leaves me with need for a “bottom feeder” and a “mid-water schooling” species. I start searching through Planet Catfish for small catfish and find Erethistes jerdoni and Erethistes maesotensis, from some experience and conflicting search results, I know that Erethistes and Hara are used interchangeably. I haven’t decided if I really want to go for catfish and loaches, so I’ll just keep these in mind for now. So now I start looking at loaches, for which, unfortunately, there is no good species resource like Planet Catfish, and come across Yunnanilus cruciatus and an unidentified Y. sp. ‘rosy’ (also known as “Tuberoschistura arakanensis”). After some more searching and enquiries, I decide that Y. cruciatus is on the too large side, and Y. sp. ‘rosy’ is about right. Both of these small loaches are schooling fish, and tend to swim mid-water. Last, but not least, I looked at the schooling fish.. I was originally planning to go for a Boraras species, but I discovered that Danio margaritatus are from the same location as Y. sp. ‘rosy’. I generally prefer to aim for biotope or at least the same continent or water type, and I have been wanting to keep D. margaritatus for many years now. When this species was first discovered, their habitat was almost destroyed by the greed of fishkeepers everywhere, and the wholesalers falling over themselves trying to collect the species. It has now been a few years, but I will still not buy these fish if they were wild caught, so I am now searching for captive bred specimens. I would also like to mention another interesting species of the same size is Danio erythromicron, it is also very unusual, but an excellent find for a small aquarium. It’s finally moving! The colour stopped developing when it was barely past 5 ppm, and was a nice purple, instead of the magenta which I am more used to. I will content myself with saying “over 5 ppm” for nitrite because I’ve watched the colour develop twice today (previously, I just came back and took the readings after the 5 minutes), and I watched it give me a 5 ppm reading after developing for 40-60 seconds and by 5 minutes, the reading was the usual magenta (although not quite as vivid as the pre-water change magenta). The aquarium currently contains approximately 50 litres, so the first water change and top-up would have reduced the nitrite reading by approximately 35% and the second by approximately 48% more. In total, the filter has processed approximately 5 ppm of ammonia already, which would have produced 13.5 ppm of nitrite, of which some has already been used to produce nitrate… but I am not quite sure about how the nitrate could have reached even 15 ppm, while nitrite remained over 5 ppm, unless I have been reading the nitrate incorrectly, which is a realistic possibility. If nitrate is currently around 5 ppm, then nitrite could still have been in the 10 ppm region before water changes. I think I will try a much bigger water change. I also received the first lot of the plants last night and, rather impatiently, added them to the aquarium. I am still not going to use any light because the ambient room lighting should be enough to keep them alive for the moment. The nitrite still does not correspond to any colour on the chart, but I am putting it down to magentas being difficult to print. The pre-water change reading was slightly more purple and the post-water change reading was more magenta. 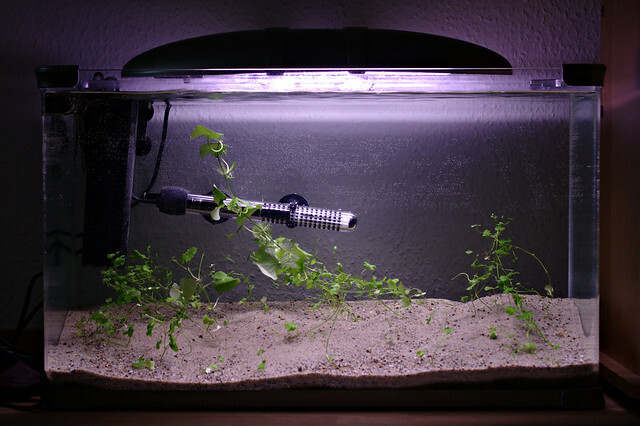 I also flattened out the substrate a little bit in the aquarium, and something (possibly the nitrite) did irritate my hands quite a bit. Cycle seems to have stalled a bit… I don’t like that the nitrites are not readable as I can not see what is happening to them. I will do a water change and test again this evening.